You choose your friends, but then their continued presence influences you and alters your direction. The same is true for almost every major element of your life: your job, your hobbies, your home, your spouse. Choosing such things should be done very carefully, because they will shape you in more ways than you realize. 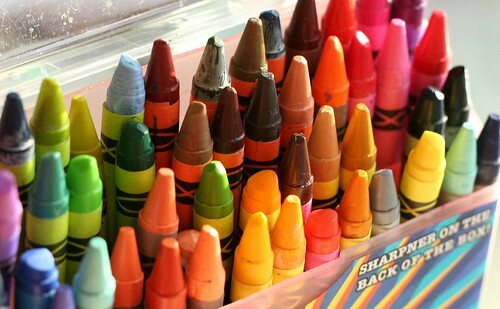 About once a week, I’ll sit down at the kitchen table with my kids and a giant box of crayons. We’ll each take a sheet of blank paper or two and just draw something, whatever we want. The results of these projects are both insightful and inspirational. My oldest child, for instance, always draws his family. He draws me, Sarah, himself, and his two younger siblings. My pictures usually involve trees. My daughter almost always draws pictures of girls in dresses (she’s three – you can actually see her artistic improvement on a week-by-week basis). As I’ve mentioned on The Simple Dollar before, I enjoy watching baseball and basketball (but not football, interestingly). Basketball is probably my favorite sport to watch from a pure artistry standpoint, and Michael Jordan is likely the best to ever play the game. Why? When you fail, you have two choices. You can either keep laying on the ground, giving up. Or you can get up, dust yourself off, and keep trying. The first option doesn’t lead to success. This is a long series of YouTube videos that walks someone who knows nothing about the piano through learning Clair de Lune by Claude Debussy. While I’m past some of the basics in this series, the straightforward guidance in this series is a great stopgap when I’m ready to tackle something new between my normal lessons. Studies have shown that once you reach a minimum income level to cover your basic needs well, people actually become less happy with more income. The peak is somewhere around $45,000 per year. More money won’t solve the problems you have in life. The solutions to those problems need to come from somewhere else. On occasion, I speak publicly. Because of that, I’m often out there looking for advice on how to present more effectively. In that search, I found this video. This is probably the best short collection of tips (presented while also being entertaining) that I’ve ever seen. If you can handle these things, your presentation will improve quite a lot. It made me want to get up on stage, which in itself is an impressive feat. Simply put, if you want to succeed at life and earn more money, you need to learn as much as you can about not only your subject area of expertise, but about every topic you can. The more you learn, the bigger the advantage you have in making connections that others do not see, and that’s really the route to earning money in this world. 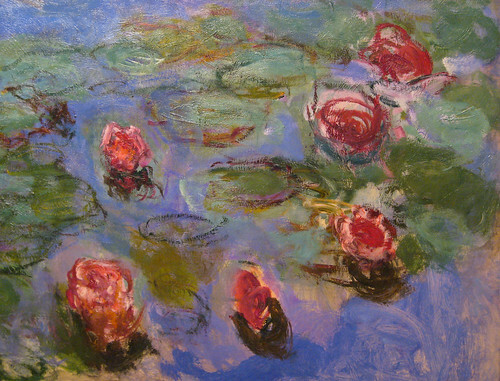 Monet’s paintings remind me of spring and make me want to sit by a lily pond somewhere. About a month ago, a friend suggested I try out Toodledo for my list-making needs. I make a LOT of to-do lists and have used Remember the Milk for years. I used it. I liked it. This week, I migrated my lists to Toodledo. It just does everything I need in a somewhat less cumbersome way, which is really all I can ask for. First, a bit of backstory. My kids like watching Sesame Street. A few times over the past year, they’ve used a segment on there about the letter T, which you can see here. For some reason, that song stuck with my kids. They would sing it all the time around the house and try to get me to sing it as a bedtime song. Since I didn’t know the words, I wound up eventually searching online for it, and I learned that the “T” song was actually a parody of a song I’d never heard before, one that embedded itself quickly in my head. This morning, I played both versions for my two kids and they actually liked the original better. They both sat still as I played it several times, rocking back and forth in a chair. So, anyway, here’s the song.